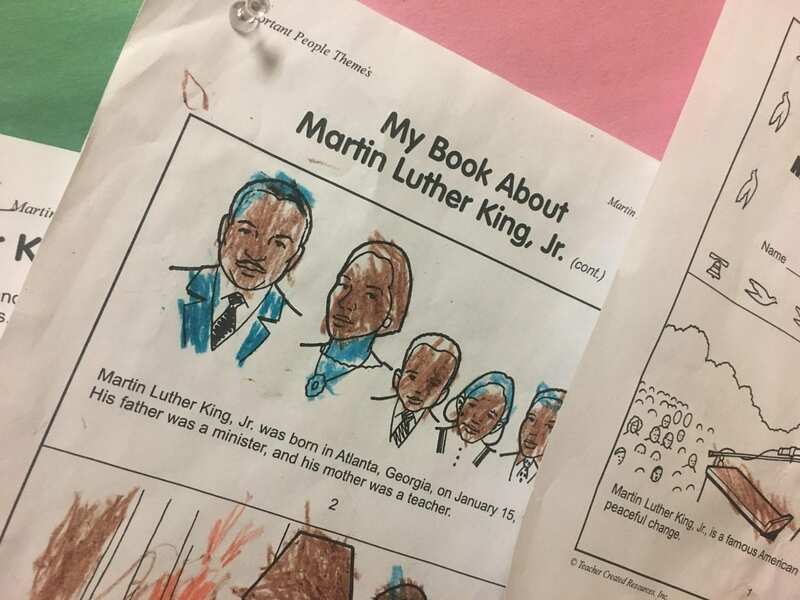 Students in after school programs at GIAC (Greater Ithaca Activity Center) created "books" based on what they learn about Martin Luther King, Jr.
People packed the gym of Beverly J. Martin Elementary School in downtown Ithaca to celebrate the life of Dr. Martin Luther King, Jr. They also were there to further his vision of a Poor People’s Campaign. It was a movement to “revolutionize” the country’s attitude toward the poor and rally them to advocate for better living conditions. After a buffet lunch and brief presentations, those attending the celebration divided into smaller groups to discuss issues and solutions to current societal problems. Fabina Colon, Director of the Multicultural Resource Center and one of the organizers of the Ithaca event, said it was important to spend time talking to each other about problems the community faces today. “If we want different solutions we must create different processes. That is, looking at some of the work that the Poor People’s Campaign is doing and being in alignment with that,” said Fabina Benitez Colon, Director of the Multicultural Resource Center and one of the organizers of the Ithaca event. Nationwide, organizers are trying to bring about a revival of the Poor People’s Campaign with an emphasis on systemic racism, poverty, the war economy and ecological devastation. “We believe that these four pillars are very important so that we can actually create a multi-pronged approach to addressing these issues in a way that actually focuses on the root causes,” said Benitez Colon. Celebration of the life and work of Dr. King continues in Ithaca. Starting next Monday, there will be a week of activities in Ithaca, across the Ithaca College campus and downtown.